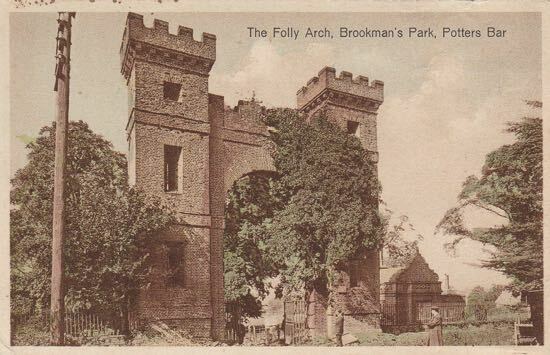 The School for the girls of the parish and for the infant boys until 1926, stood at Water End from 1847 to 1960. The accommodation was for 130 pupils so that during those 113 years of social change thousands of children passed through the school. What kind of influences did they come under? These sprang from three things; the school’s origin, its location and the narrow range of occupations available; the chief being domestic service. Founded by Miss Caroline Casamajor, it was endowed by her with the income from £3,000 worth of 3 per cent Bank annuities to provide for salaries, materials and upkeep of the school and schoolhouse. 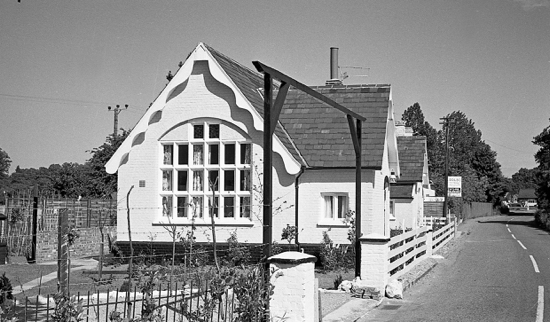 A National school, it was controlled by the Vicar and Managers appointed by the parish vestry. Money was short; building maintenance was often criticized by H.M. Inspectors. Gas lighting came eventually in 1951. The curriculum in the earlier years emphasized piety and needlework. Annual Diocesan examinations tested the children’s knowledge of the catechism and the scriptures and the Bishop’s Inspector commented favourably on the reverent tone and the understanding of the Gospels. The girls were busy making handkerchiefs, nightdresses, pillowcases, pinafores, towels, gloves, scarves and stockings. They were awarded lengths of serge and dress material for good attendance. Such an emphasis left less time for the three R’s; not to mention history and geography. A gradual change came with the 1902 Education Act: The new status of a ‘non-provided voluntary school and the advent of a new young headmistress; Mrs Cooke. Religious instruction lost some of its priority and fewer hours on needlework, meant more for reading. Prizes were still for attendance and conduct rather than for scholastic progress; for goodness rather than cleverness. No child won a scholarship to a grammar school until the 1930’s. 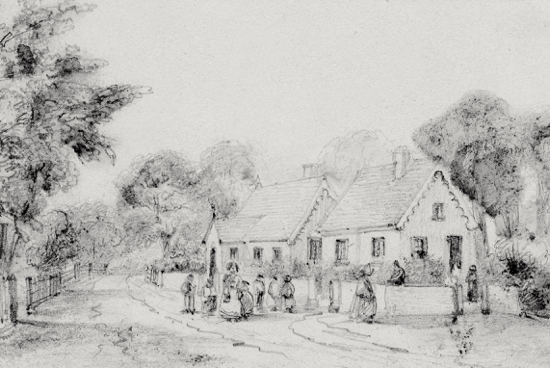 Many of the difficulties for the devoted headmistresses arose from the isolated position at one end of the parish. Young children, having walked long distances, often had to be dried out and sent home. Bad weather caused low attendance and some times closure. 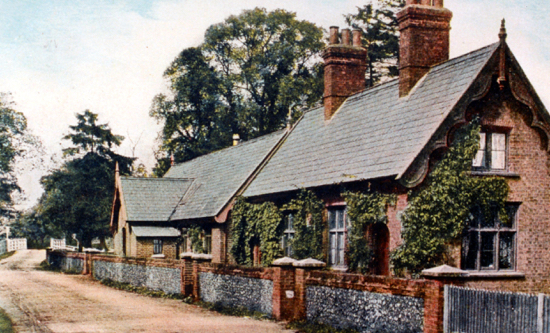 This handicap was not removed until 1916 when the Welham Green school started an infants class, after repeated pressure from the parish council. The girls were kept away when their mothers were haymaking and potato picking, and later, in 1914 - 1918, when they were sent to fetch coal from the sidings and to pick potatoes themselves. These factors may go to explain the very high turnover of assistants. Teachers came and went. Fifty-three teachers appear in the school logbooks between 1920 and 1960. "The happy and thoughtful way in which the headmistress directs the school ensures its success. Skills acquired in reading and writing are used to good advantage so that not only do the children go natrually to books for pleasure, but they write readily on many topics. Use was made of their knowledge in arithmetic to solve problems. History, geography and nature study are all treated in a stimulating way, full use being made of music broadcasts and easels for art lessons have recently been acquired…"
Only a few years later, with only 27 on the roll, the school was closed. 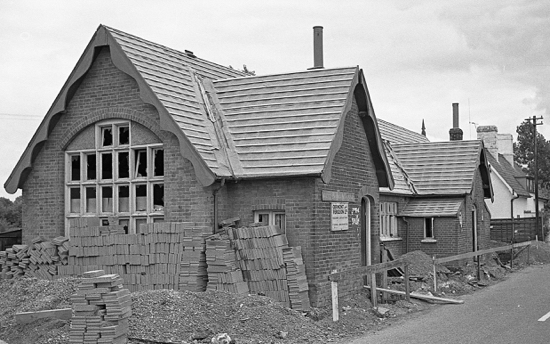 The building, first converted to a dwelling, was demolished to make way for the A1(M). Site editor's note: The original piece by Peter Kingsford didn't contain images. These have been added since. 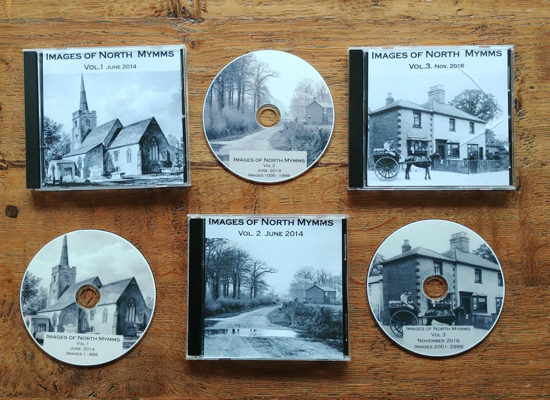 All images from the Images of North Mymms collection digitised by Mike Allen.